Patricia Zavella's article appears in the Winter 2009 issue of Ms. magazine. In an article in the Winter 2009 issue of Ms. magazine, Patricia Zavella challenges Congress to reform immigration law. Zavella, a professor and chair of Latin American and Latino studies, showcases the life-and-death decisions immigrant women face as they decide whether to risk crossing the border. 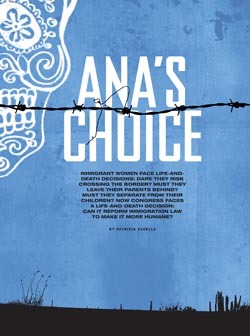 The article, "Ana's Choice," highlights the "feminization" of immigration. Women now make up 46 percent of authorized migrants from Mexico and about one-third of all unauthorized migrants, a jump from 26 percent before the 1986 Immigration Reform and Control Act, writes Zavella.